I was really excited when Evan of swEEts by e contacted me about guest posting. I just recently started reading her blog because my huge sweet tooth got all excited when she made Swiss swirl ice cream, red velvet cupcakes and bite-size s'mores. Chick knows the way to my heart. And her creations are pretty. She just made a wedding cake (her first, of many I'm sure!) for her friends and it was gorgeous. Consider me officially impressed. If you're anything like me then you love coffee and if you love coffee, well then you (should) adore biscotti. It is my firm belief that every good cup of coffee deserves a delicious baked good to be paired with, but unfortunately, with the hustle and bustle of our busy work week we often forget this and let our morning cup of joe go without… but fear no more! Although muffins, scones and rolls are wonderful breakfast baked goods, they don't keep very well throughout the week. Day one of a muffin is great...day two, OK… but much longer than that and you're not getting much. The great thing about biscotti? they can be kept for a week or more in an air tight container! A delicious, dunkable, dippable, little breakfast cookie that can be made in one batch and munched on all week long- fabulous. One of my favorite baking books, 'A Passion for Baking' by Marcy Goldman, has a whole section dedicated to this delectable little treat, which is where this recipe comes from. 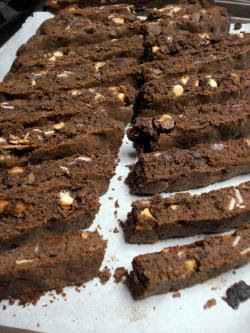 She has recipes for everything from Cafe Late Caramel Biscotti to Blueberry Biscotti Bones and these Double Chocolate Biscotti (I added the almonds). These biscotti were actually baked with Mountain Man (my boyfriend) in mind who requested something chocolate-y for breakfast that he can bring camping with him. Since biscotti can be easily packed and kept a while, they seemed the perfect choice. With two different kinds of chocolate chips and a chocolate base, this is sure to get him the chocolate fix he needs. A word of warning, there are a few steps involved when making biscotti- a lot of removing, cooling, and returning to the oven. Biscotti gets its crispy texture from the second baking, making the extra steps crucial for their texture...I swear it is totally worth it! In a small bowl, whisk flour, cocoa, baking powder, baking soda and salt. In a large bowl, cream butter and sugar. Add eggs one at a time and vanilla. Mix dry ingredients into butter/sugar mixture, making a thick batter. 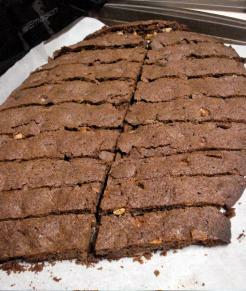 Fold in semi-sweet chocolate chips, white chocolate chips and almonds. Let dough sit for a few minutes in order to thicken and firm a bit. 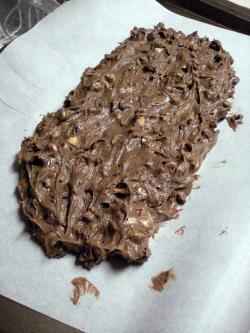 Spread dough into a large log on prepared baking sheet. Bake 35-40 minutes until set and log is firm to the tough. Remove from the oven and allow to cool for 15-20 minutes. Reduce for the temperature of the oven to 325. Using a large serrated knife, slice the log diagonally into 1/2 thick slices. Because of the size of my log I actually cut each slice in half as well. Arrange slices, inside facing upward, on baking sheet and return to oven. Bake for 15 minutes and then turn slices over and bake for another 15 minutes. Remove from oven for good and allow to cool completely. Optional finishing touch- melt 1 cup chocolate chips in microwave for about 1 minute(stop at 30 seconds and mix) and mix until smooth. 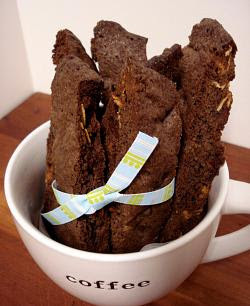 Drizzle over cooled biscotti or dip one end in melted chocolate. Biscotti are just like muffins- the flavor possibilities are endless… so figure out what you like and give ‘em a go :) Your coffee will never be lonely again! Lovely post...I completely agree that coffee should be paired with a baked good...and any cup of joe would be lucky to have a piece of this biscotti by its side. Ive never had chocolate biscotti before! This looks so good :) Eventhough I'm not a coffee drinker, I do love biscotti! That might explain why I've never liked biscotti -- I don't like coffee as our Mocha Acolyte can attest to. Drinking my coffee right now! No biscotti though. Great guest post. Lovely recipe, photos, and clear instruction. Fantastic job with the biscotti. 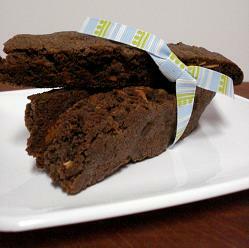 biscotti is so wonderful and she is right, totally worth the steps in making it! Evan - This is fabulous, just like all your recipes!